Fort Polk Progress, as part of its Education Initiative, recognizes 11-year-old, Sarah Kennison, a fifth grader at Vernon Middle School in Leesville, as the Vernon Parish School District’s 2014 Elementary Student of the Year. Sarah has a perfect 4.0 grade point average and at an early age exemplifies the pursuit of excellence. Sarah, is the daughter of U.S. Army Sergeant First Class William Kennison and Jennifer, who are stationed at nearby Fort Polk. Born in Cleveland, Ohio, Sarah will be in Leesville for one more year. She is typical of Army children who follow their parents from post to post. Besides Ohio and Louisiana, she has also lived in South Carolina, Florida and Tennessee. However the constant travel has not deterred Sarah. She has concrete plans for her future. Sarah is involved in many school activities including the Math Olympiad, Students Against Disruptive Decisions (SADD) and Future Leaders of America. Besides her work with several student clubs on campus, Sarah is also a budding musician. She learned to play the piano last year and began taking clarinet lessons this year. She also enjoys reading and the triathlon. 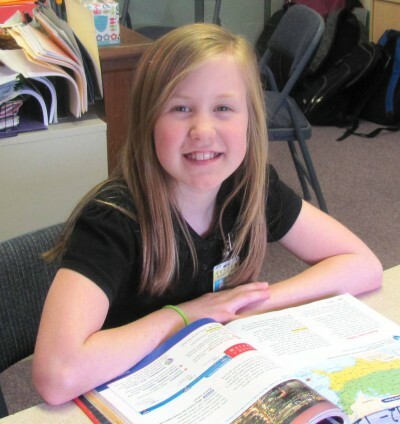 Her favorite subjects in school are English language arts (ELA) and mathematics. Sarah is motivated by her parents, but she also understands that she has to be prepared to compete in an ever changing global economy.